“In Flanders Fields” is a war poem written during the First World War by Canadian physician Lieutenant-Colonel John McCrae. He was inspired to write it on May 3, 1915, after presiding over the funeral of friend and fellow soldier Lieutenant Alexis Helmer, who died in the Second Battle of Ypres. The most sacrosanct and central element in Remembrance is the Two Minutes of Silence. 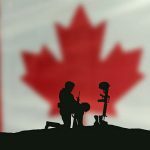 During this time of reflection, Canadians pause to honour, thank and remember our Fallen. 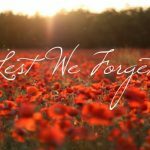 Langley / Aldergrove: There will be a parade (10:30 a.m.) and ceremony (10:50 a.m.) at the Douglas Park Cenotaph (20550 Douglas Crescent). Additional ceremonies will be held at the Fort Langley cenotaph (23105 St. Andrews Avenue) — parade begins at the cemetery at 10:25 a.m. — and at the Aldergrove Legion cenotaph (26607 Fraser Highway) at 10:50 a.m. following a short parade which begins on Ol Yale Road near 268 Street. For the first time, a formal ceremony at the Murrayville Cemetery cenotaph (21405 44 Avenue) will take place at 10:45 a.m.